The previewed desktop OS will launch alongside a new 12-inch MacBook Air, and a 4K desktop machine. 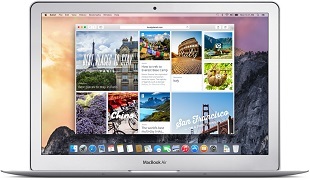 The next major iteration of Apple's OS X operating system will reportedly launch in October, one month after iOS 8. Called Yosemite, OS X 10.10 has a number of aesthetic changes when compared to 10.9 (Mavericks). Yosemite will also work very closely with iOS devices, offering continuous client-esque features to those fully invested in the Apple ecosystem(s). The popular rumor is that the iPhone 6 will launch in September alongside iOS 8. Similarly, new hardware will launch with OS X Yosemite the next month. First, a new 12-inch MacBook Air will be introduced, and 9to5mac says the new machine will be "much thinner and slightly lighter," while featuring a Retina Display, and the aluminum body MacBook users are already familiar with. On top of a new laptop/ultraportable, Apple will release a desktop product featuring a 4K resolution display. It's not yet clear if the machine will be an iMac, or if the product in question is a standalone 4K Cinema Display. My money is on both -- why keep 4K stuck in an all-in-one if you can separate the tech out into a standalone (and likely very successful) piece of hardware? The last time the iMac received an update to its display was 2012, when the slim unibody models were first announced. While the models got an internal spec boost last year (new CPU, new GPU options), the 27-inch 2560x1440 display has not changed. A new high-end iMac with a 27- or 28-inch 4K displauy is not outside the realm of possibility.